There is probably no grooming task for dogs that is less understood or practiced than how to properly clean their ears and eyes. Regardless, it is critical that the time and effort be taken to do this since failure can cause your dog to develop serious infections and long-term damage. This article will serve as a guide to how to help you ensure that your dog will enjoy good eyesight and hearing throughout their life by carrying out good care. If you observe wax and debris in your dog's ears, it can be cleaned with medications that you can get from your veterinarian. This is especially true if you have reason to believe that your dog is experiencing pain from their ears. ​This might be a case exclusively for a veterinarian since it might be necessary to sedate your dog and take samples of whatever is in your dog's ears. From this point, a veterinarian will take culture samples and have a lab analysis done of the material he obtains. If your veterinarian prescribes medication for your dog's ears, be sure that you follow those instructions to the letter. It is important that you keep tabs on these instructions and let your veterinarian know if there is any change in your dog's condition. Even if your dog seems to have normal ears, it is always good to have a veterinarian recommend some kind of solution for everyday cleaning. These medications often called a "flush," will help you to ensure that your dog's ears stay clean and bacteria-free. Fortunately, these washes are easy to use and are quite effective. All that is needed is to squirt the solution into your dog's ear or apply some with a cotton ball, then gently massage around the base of your dog's ear to make sure that the liquid gets deep into your dog's ear canal. Next, let your dog shake and get the excess material from his ear. Then repeat the process. When you are done you can use another cotton ball to remove the residual material. Do not use cotton swabs on your dog's ears since they can lead to damage of the ear drums. It's usually best, as well as most convenient if you make cleaning your dog's ears part of their usual grooming routine. If your dog's ears are full of hair and you notice that they are often moist inside, it would be a good idea to clean them. If the amount of hair is excessive, it would probably be a good idea to let a professional groomer or veterinarian remove the hair from the ear canal, especially since doing this incorrectly can lead to damage and potential infections. If you observe your dog shaking his head during this treatment or trying to get away during your attempts to give them this treatment. Or, there is a foul odor coming from your dog's ears, take him to a veterinarian for a closer professional examination. Moist​ it with warm water and dab it on the matter, not directly on the dog's eyeball, since this can cause scratches on the eye. If you have a longer haired dog, you might have to trim the hair around the eye. ​Also, get a good look at the condition of his eyes as well as to make it easier to examine the eyes yourself. A dog's eyes are remarkably durable, but they can also be very delicate. For this reason, you should always make cleaning your dog's eyes part of your regular grooming schedule. Always take a good close look at your dog's eyes to make sure that they are clean and clear. If there is a lot of accumulated hair around the eyes, use blunt nosed scissors to clean this away. It is also important to keep your dog free of places where there might be things nearby that could cause trauma to the eyes. Be sure that you don't mistake common eye buildup with a more serious eye infection. 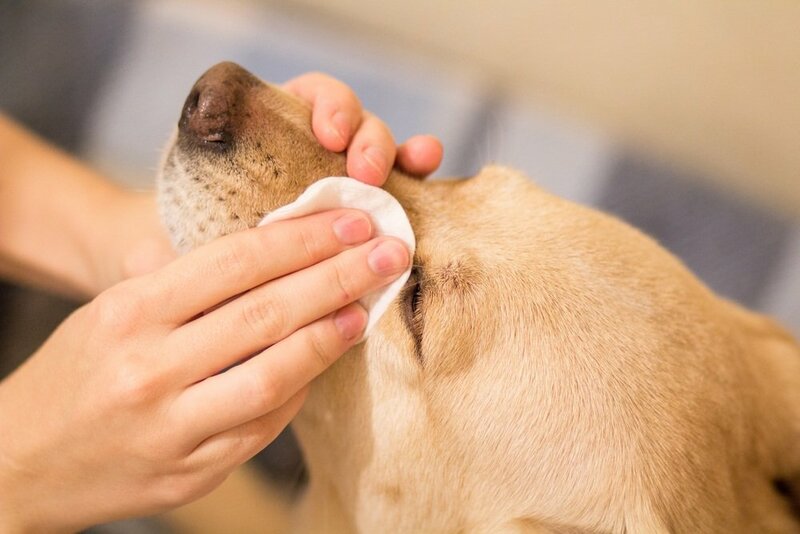 In many cases, an eye buildup can cause a tear duct blockage, which can in turn cause liquid from the eye to back up and drain out them middle of the eyelid and onto their chest, causing brown stains on their fur. This type of problem should also be checked by a veterinarian since it might be best treated with a special instrument. Keeping your pet's eyes and ears clean might seem like a lot of extra attention. But when you integrate these tasks into your normal grooming routine, you will not only be making your dog happier and healthier. Also, you might very well keep from having to make additional trips to the veterinarian, not to mention having your dog as a companion for more time.